A guide to creating vegan versions of staple ingredients to stock the fridge and pantry--from dairy and meat substitutes such as vegan yogurt, butter, mayo, bacon, and cheese, to mustards, dressings, pancake mix, crackers, pasta sauces, cookies, and more. Kitchen crafters know the pleasure of making their own staples and specialty foods, whether it's cultured sour cream or a stellar soup stock. It's a fresher, healthier, more natural approach to eating and living. Now vegans who are sick of buying over-processed, over-packaged products can finally join the homemade revolution. 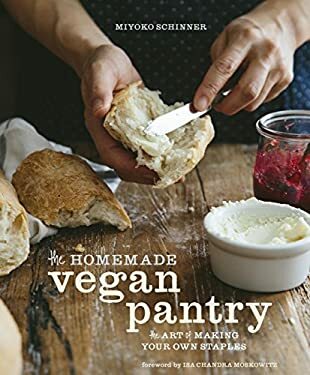 Studded with full-color photos, "The Homemade Vegan Pantry" celebrates beautiful, handcrafted foods that don't take a ton of time, from ice cream and pizza dough, to granola and breakfast sausage. Miyoko Schinner guides readers through the techniques for making French-style buttercreams, roasted tomatoes, and pasta without special equipment. Her easy methods make "slow food" fast, and full of flavor. "The Homemade Vegan Pantry" raises the bar on plant-based cuisine, not only for vegans and vegetarians, but also for the growing number of Americans looking to eat lighter and healthier, and anyone interested in a handcrafted approach to food.